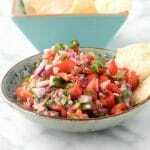 Making chips at home and fresh pico de gallo is so easy you may never buy them again! Combine all the ingredients into a large bowl. Mix completely. Allow to sit a few hours or overnight (refrigerated). Salt to taste and serve. Preheat the oven to 350 degrees. Line a large baking sheets with parchment paper. Using a basting brush, lightly brush with olive or vegetable oil, or alternatively spray with olive oil spray. On a cutting board, brush the top of a corn tortilla lightly with olive oil ensuring the entire surface and edges are coated. Add a second tortilla on top of the oil-brushed tortilla and repeat. Continue this pattern until there is a stack of tortilla with the top surfaces brushed with oil. Using a large kitchen knife, cut the stack in half creating two stacks of semi circles. Cut each half stack in thirds to create wedges. 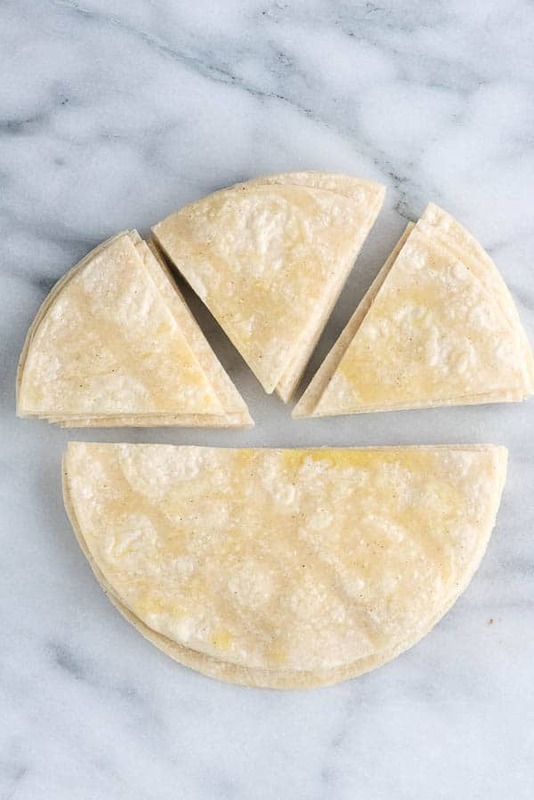 Line the tortilla on the prepared baking sheet in alternating directions to fit as many onto a sheet as possible without letting the tortilla wedges touch each other. Sprinkle lightly with salt. TIP: take a pinch of salt between your two first fingers and thumb, holding them about a foot above the baking sheet gently rub your fingers and thumb allowing a small amount of salt to fall onto the chips. 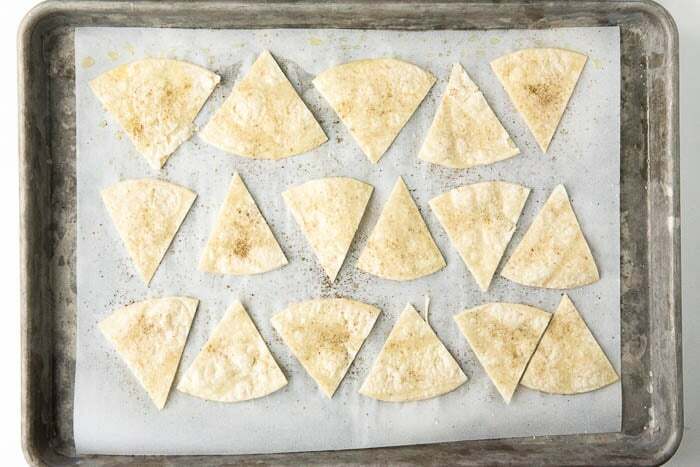 Move over the tray to sprinkle on all wedges. Holding hand high above the tray allows more control to lightly cover chips. Place the baking sheet in the oven. Bake for 7 minutes and rotate the tray. Bake an addition 7-8 minutes, test a chip for crispness; chips will continue to become crisp as they cool outside the oven. If crisp enough remove and allow to fully cool. Or return to the oven to cook another few minutes before removing and allowing to cool.